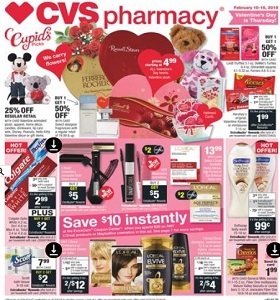 CVS Weekly Ad February 10 - February 16, 2019. Cupid's Picks! CVS Weekly Ad February 10 – February 16, 2019. Cupid’s Picks! -buy 1 get 1 50% off Oral-B manual toothbrush multipacks or Fixodent; buy 1 get 1 50% off Select Centrum or Caltrate.